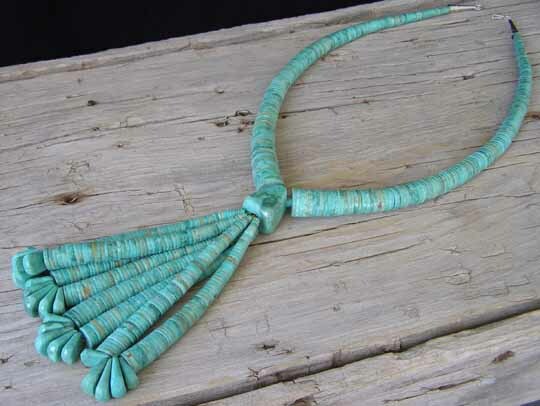 This is a beautifully traditional rendition of a jocla necklace made of hand-turned graduated beads of green Kingman turquoise. The largest beads form the top necklace portion, while four jocla loops made of matching stone hang from the center of the necklace. A large, hand-carved triangular bead joins the upper strand to the jocla loops. The beading string (on which the top portion's beads are strung) passes through the large, hand-carved bead and provides the string on which the jocla loops are strung. This is the essence of a ceremonial necklace and you'll see many renditions of this style, though very few so sumptuous, at any large feast day dance at Santo Domingo Pueblo. This is strung on rug thread, which is often used for larger, heavier necklaces. It is strung tightly now because it's understood that the heaviness of the beads will cause the beading string to stretch a little over time as the necklace is worn and broken in through wear. The tightness won't bother you in wearing it now and it will become just perfect as you wear it through the years. Length of top necklace portion: 27"